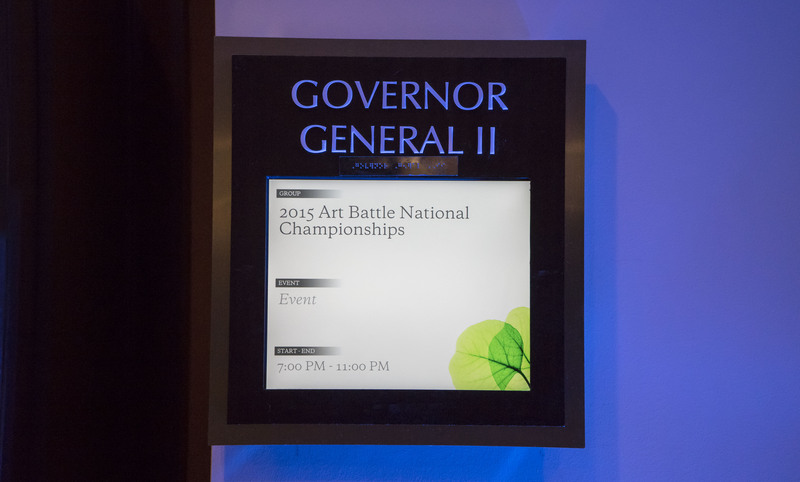 July is full of events in Ottawa and in the last minute, I didn’t realize about the Art Battle National Championship. A good friend from Toronto mentioned on social media that she was in Ottawa to host the event. Luckily, I was able to make it to event and to The Westin Ottawa. The Art Battle National Championship was their final event of the sixth season and Ottawa played host to it. The live painting competition pitted 16 winners from coast-to-coast, province to province and to become sole winner for the 2015 edition of Art Battle National Champion. Plus, the winner would get a spot for the International Live Painting Championships at the Pan Am Games in Toronto. There were 3 rounds and people voted for the artists to advance to the 3rd and final round. It was a load of fun as people walked around to see how the artists were painting within 20 minutes. Oh yeah, for those wondering, the winner of the National Championship was Leanna Teneycke from Oakville, Ontario. You can check out the photos over at Flickr by clicking HERE. You can check out the Impossible photos from below. This is a Summer entry as I’m not posting often. Keep checking my feeds on social media. It has been a rainy week in the Nation’s Capital, but the wet soggy and chilly climate could not deter various events happening on the weekend. I had the opportunity to attend the Ottawa Mini Maker Faire, which was held at the Canada Science and Technology Museum. The family-friendly event which in its 4th year is a festival of creativity and showing inventions coming from a DIY aspect. A lot of exhibitors ranged from gadgets to a lot of demonstrations from robotics and products using 3D printing, just to name a few. There were workshops and panel during the event. Over 600 plus came out to the event for Saturday, quite surprising as the festival brings out the fun technology in all ages. Photos from the event are posted on Flickr, you can check the photos by clicking here. The other museum to go on Saturday night was at the Canadian Museum of Nature. It was a lion dance performance for a wedding reception. Prior to performing, I brought along the Polaroid Spectra Camera to try shooting the double exposure effect. I posted two photos onto my Facebook page and I will post them here. The lion dance performance was great as usual and the newlyweds probably enjoyed the colourful lions dancing around them for good luck and prosperity. The photos are also on Flickr, you can the photos by clicking here. Overall, it was a great weekend in Ottawa. Another event is happening and that’s the Arboretum Music Festival. It’s in their 3rd year running and they got an excellent lineup from the Constantines, Kevin Drew, Hilotrons and a bunch of others. There’s definitely lots of do in Ottawa as Summer is not quite over yet. This week’s guest for the Social Media Summer Series, it was an opportunity to bring in Jenna Tenn-Yuk. All I have to say that she’s multi-talented with the poetry and music that she showcases. The topics discussed were blogging, some social media and what’s great about Ottawa. Another part that was delved on today’s show as Tenn-Yuk wrote on her blog in 2012 about coming out of the closet. The topic on LGBT was brought up and I was being careful in asking the right questions. Briefly mentioned during the music break was on the late singer, Leslie Cheung as I thought she might know Chinese music (known as Cantopop). Songs played this week were new music from Shad, Basia Bulat, The Balconies and The Naked And Famous. It’s exciting to hear new releases from bands and artists as we anticipate their new record. The playlist can checked at this link. You can listen to the audio below. As usual, I was joined by Katarina, host of The Cloud on CKCU-FM. All in all, what a great way to end July. I totally apologize if I didn’t introduce her name on the air. Lastly, I’m enjoying taking photos from the Fujifilm Instax. As the photo posted above was taken on the Instax. I may not be a trendsetter but I’m just having fun shooting photos from digital and analog. Programming note, The Wild 10 Countdown will be on a Summer break and will try to post the July 24th edition as soon as possible. Have a great long weekend as we get into August. Update: Here are links as Tenn-Yuk was in the news about LBGT. CBC Radio One interview on Ottawa Morning (August 23, 2013). The Ottawa Citizen Op-Ed from August 19, 2013.